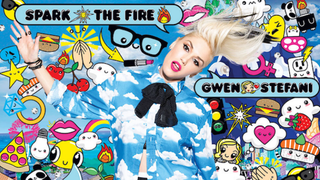 Earlier this month at the Odd Future Carnival, Pharrell previewed a bit of this Gwen track and said it was "about feminism." Today, Stefani dropped the album art and the song hit the internet tout suite. Not totally sure what this has to do with feminism, really except, is everyone just discovering Le Tigre or what is going on? Also, MIA. Stefani's chorus for "Spark the Fire" (listenable at Stereogum) is a very call-to-arms shout in a Maya Arulpragasam world—yes Stefani helped pioneer the cheerleader-shout as quasi-rapping on a subbass-heavy steez, but if you'll recall, her first solo album, Love Angel Music Baby, dropped half a year before MIA's debut, Arular, and the pop landscape has changed immensely since. Stefani knows that—her last single, "Baby Don't Lie," is essentially a throwback jam—so on these two songs, she seems like she's trying to bridge the difference between her super-kicky pop art persona of the early 2000s and the fact that her core cool fans have moved deeper into the internet, exploring nichier and/or more diasporic sounds. Diplo named his new baby Lazer, nahmean? Must not bury lede: it's hard to listen to the start of this version of "Spark the Fire" and also envision her on The Voice, giving aspiring young musicians lessons about singing. This is an unmastered version, right? The pitch is slightly worse than Jessica Lange's on American Horror Story: Freak Show, and Lange's playing a wash-up hooked on opioids. What would Dionne Osborne do? Maybe tell her to ride on into the verse, which is where it gets better. Stefani is at home in motivational shout mode, and it's the reason she can make jams like this that sound like an amalgam of others but still win: she's on a Missy Elliott flow but the charisma in her tone is indefatigable, plus she's spouting lyrics like, "the person next to you, feel the energy/let's lift them up as high as can be," which may be the hinted-at allusions to feminism. Pharrell's beat is a throwback, too, to his own work: it has the cold precision of his work for The Clipse, but interpolates the bells from Bob James' oft-sampled "Take Me To the Mardi Gras," giving an updated pep rally track a subtle classic hip-hop feel. It's not the best single in the world, but it also seems like a grower, and fun to mix in the club. In other Gwen/Pharrell news, they're collaborating on "Shine," the theme single for Weinstein's children's film Paddington. So get happy, or scared.